Yasai itameru is a fresh and flavoursome soupy noodle dish with a kick. It’s bursting with the wonderful flavours of garlic, sweet coconut, zingy ginger, salty soy sauce and a wealth of interesting vegetables. And the tofu soaks up all of these delights as well as you’d expect. This recipe is taken from the Wagamama cookbook; which is, without a doubt, my favourite ‘fast food restaurant’ in London – if it can be classed as that. I mean, the food comes out fast. And it’s always brilliant. Well, apart from that one time I was given chicken gyoza instead of vegetable gyoza. But they did make up for that, so I forgave them. If you’re not familiar; go there! They have them all over the UK! Find your nearest one here. And try the salmon teriyaki – so tasty. I absolutely love Japanese food. I’d even go as far to say it’s my favourite cuisine. I was lucky enough to visit Japan in 2010 while a good friend of mine was out there teaching. We ate out every night for two weeks; it was amazing. We gorged ourselves on sushi, curries, noodles, ramen, okonomiyaki, salads and more. There was so much to try and all of it so tasty. Just thinking about it makes me want to go back. But luckily, there are a good few Japanese restaurants in London which won’t dent my bank balance so much. I could go into more depth about my love of Japanese food, but instead I’ll move on to the meal in hand. I’ve adapted this recipe slightly, substituting some of the fresh spices for the dried stuff to save having to buy too many unusual ingredients. It’s quite a multi-faceted meal to make as you’ve got 2-3 pans on the go at once, but it’s not too tricky. And the results are worth it. 1. Make a start on the broth first. Heat the oil in a large frying pan over a low heat for a few minutes. Add the garlic, ginger and galangal, being careful of the hot oil. Mix well and cook on a low heat for six minutes, until you can smell the mixture of aromas. 2. Add the hot water and bring to the boil, adding the salt and sugar. 3. Simmer for 20 minutes, until the liquid has reduced by half. 4. While the broth is simmering, half-fill a medium-sized saucepan with water and bring it to the boil. 5. And while the water is heating up, heat a wok over a medium heat for a couple of minutes. Add the sunflower oil and swirl it around so it covers the surface of the wok. Add the crushed chillies and garlic and fry for 10 seconds, stirring. 6. 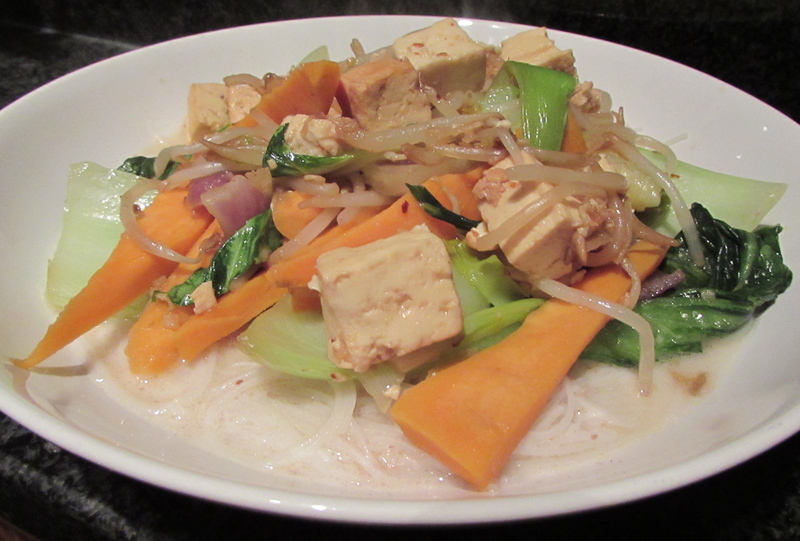 Next, add the tofu and coat it in the garlic and chillies for another 10 seconds, then add the pak choi, red onion, spring onions, sweet potato and beansprouts and stir fry for 5-10 minutes, until the pak choi has started to reduce in size. 7. When the water in the saucepan is boiling, add the noodles and cook for two to three minutes. Drain and rinse them under cold running water, and set them aside. 8. Add the salt, sugar and soy sauce to the wok and stir fry for five minutes, or until all of the ingredients are cooked – making sure the sweet potato has softened, but still has a bit of bite. 9. Check on the broth. If it has reduced, add the coconut milk and stir well. Cook on a low heat for a couple of minutes. Add the noodles and stir into the broth, and heat through for five minutes. 10. Serve the noodles in shallow bowls topped with the stir fry. Add a lime wedge and some fresh coriander sprigs as a garnish if you fancy.